According to the Emerging 7 Cities Report, released by PricewaterhouseCoopers (PwC) Russia, India’s financial capital trails Moscow in many aspects, but is safer and has higher growth prospects. If you’re looking for a safe and inexpensive city in one of the 7 fastest emerging countries, then Mumbai may be your best bet. However, if it is infrastructure, technology, public libraries and good transport then Moscow is better placed than India’s most populated city and only trails Beijing, according to a new report. On the sidelines of the on-going Moscow Urban Forum, PwC released its second annual report comparing the Emerging 7 Cities of Opportunity (E7). Moscow took second place in the PwC rating From Moscow to Sao Paulo, which was based on a comprehensive study of seven cities that also included Mexico City, Beijing, Istanbul, Jakarta and Mumbai. The cities were compared on 59 different variables, in ten categories. Over the last year the leading three cities have remained unchanged with Beijing taking first place, followed by Moscow and Mexico City. In order to avoid any city receiving a high ranking based only on its size, the variables were adjusted keeping area and population in mind, PwC explains in its report. For collating data for the study, three main sources of information were used: international organizations, such as the World Bank and the World Health Organisation, national and municipal offices for statistics, and finally, PwC’s commercial information. Furthermore, to study the cities which were to be part of the rating, the company did surveys of its own staff living in the seven cities. “The impression made by the megalopolis on its residents and guests is often more eloquent than figures and provides information on the trends and problems of contemporary city life,” said David Gray, managing partner at PwC Russia. The report’s authors noted two tendencies over the year. Firstly, the difference between Moscow and Beijing was closed dramatically; Secondly, there is an increasing lag among the other cities of the E7 behind the Russian and Chinese capitals. Moscow, which comprises of 2511 square kilometres, is four times larger than Mumbai, while the cities house the same number of people- around 12 million. 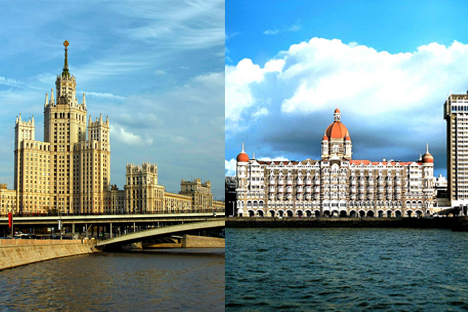 According to the study, Mumbai has a much lower crime rate, more internal stability and personal freedom than Moscow. The Russian capital has a GDP per capita of $32,000 compared to $4,600 in Mumbai, but the study points that the Indian city has better growth prospects to go along with a lower cost of living. PwC ‘s research also showed that Moscow has more public libraries and quality institutions of higher education than Mumbai, but lags behind the Indian city in intellectual property protection. The Russian capital’s schools have more widespread internet facilities but the broadband speed is the same in both cities. The study found that Moscow is more attractive to foreign tourists and has better tourist facilities and better public transport. Mumbai beat the Russian capital in solid waste processing and recycling. Air pollution is an equal major problem for both cities, the report stated. The article was written in collaboration with PricewaterhouseCoopers.